"I have a particular fondness for Shadow Games. It is not only a terrific novel, but it was my introduction to the work of Ed Gorman. The year was 2000. I made a habit of studying and writing in a library not far from where I worked as a pizza delivery driver; a job I won’t recommend, but a job that treated me well just the same. My usual table was tucked at the back of the fiction stacks. I sat, my back to the wall, facing a bookshelf packed with the latest genre titles making study nearly impossible since the stories beckoned me. "There was one title that, day after day, caught my attention. It was a mass market paperback, black background with orange-red print and the large white Leisure Books logo—a publisher I miss badly—at the top of its spine. Its title, Shadow Games. 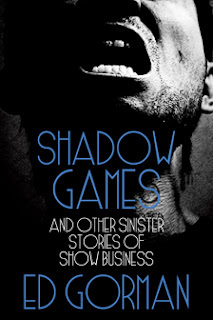 When I finally relented and read Shadow Games, sitting right there in the library, its tale of Hollywood ambition, perversion, and lost potential, all told in a darkly humorous tone, made me a lifetime fan of Ed Gorman’s work." Shadow Games and Other Sinister Stories of Show Business is available from Amazon and direct from the publisher, Short, Scary Tales.